Now, we’re not just making words up. But even if we were, the only difficulty you’ll have in saying them is having your mouth full when you do. 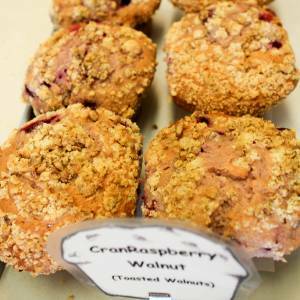 That’s the problem with the CranRasberry Walnut muffin. It inspires bad manners, speculations into the English language and its roots, the sound mindedness of bakers, and the proclivity of French-Canadians to make the most absurdly splendiferous muffins.